Find out about our store and locations. 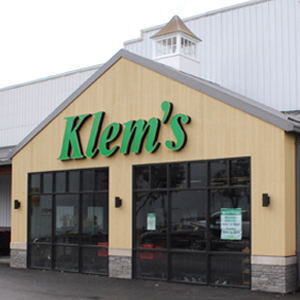 Klem's was founded in 1946 by John and Bernice Klem. It began in Hardwick Massachusetts as a tractor repair shop. In 1947 John Klem met Henry Ford and purchased a Ford Tractor dealership, moving to its current route 9 Spencer location. In 1979 the business passed down a generation to Mike Klem. He expanded the store to include Agway, and expanded again in 1989 to include a Greenhouse and Ace Hardware. Then in 1996 with the closure of The Fair department store, the business again expanded to include Housewares, Crafts, Educational Toys and Sporting Goods. In 2004, a 20,000 square foot expansion was completed. This latest expansion included updating the aquarium system, the air conditioning system for the entire building, and adding more space for merchandise and displays. In 2011, Mike Klem's daughter Jessica Bettencourt was appointed President of the business.